Can I Profit From It? The Rosetta Start-Up production process is simple, but you don't have to take our word for it! Watch the videos below to see for yourself. If you have any questions about the wetcast production process or would like to learn more about the what equipment comes with the start-up packages, contact us or fill out the form below. Make sure any excess concrete is scraped and vacuumed out of the form. Once it is clean, spray on the release agent, making sure to coat all sides and corners in the mold. Make sure all forms are poured with integral color. 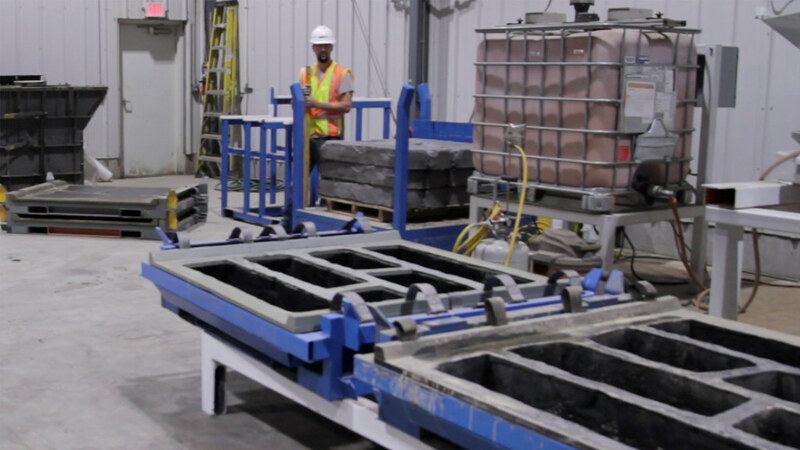 If you're not using SCC concrete, make sure each form is properly vibrated using a two-stage vibration table to work out any air in the concrete. Once the concrete has cured, strip the forms using a forklift and the 360-degree rotator that attaches to the forks and places blocks onto a springboard. Next, slowly place the blocks onto the palletizer. Have one person place the steel bar so the blocks can slide into position. Note: When palletizing Grand Flagstone, place a layer of styrofoam between each course for product protection. To strip and palletize steps, place one step on each side of the palletizer. Use a forklift to slide between the openings and lift both steps at the same time. Place the steps onto a pallet, using stickers between each row for protection. Finish off your pallets by shrink wrapping the product for easy storage and shipping, as well as extra branding. As you “wrap up,” stage the product in your yard ready for sale and stage the forms to repeat the process all over again! Fill out this form to download an outline of the equipment needed to get started making Rosetta Hardscapes and meeting the demand for quality hardscapes in your market. We'll be in touch to answer any questions that might come up after you've taken a look at the options! We like you, and we hope you like us! That's why we'll keep you up to date on new Rosetta Hardscapes product info, design resources, and more about once a month. Don't worry, you can unsubscribe at any time! What will your company’s return on investment be when you start making Rosetta? Use the Get Pricing form for more information. We are here to answer your questions about the Rosetta business opportunity.